It is a wonderful feeling to discover a gardening hack that saves you time and effort without decreasing the health of your garden. Imagine the extra time you would have if you never tilled your garden again. Guess what? Not only can you save time with a no-till garden, you can improve the quality of your soil that way too! 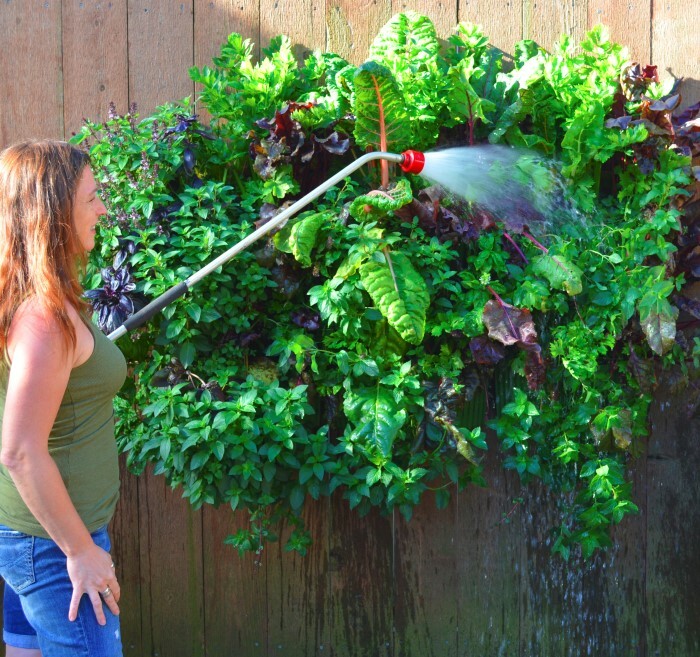 My friend Shawna Coronado is a talented gardener, promoter of green lifestyles, and garden-hack pro. 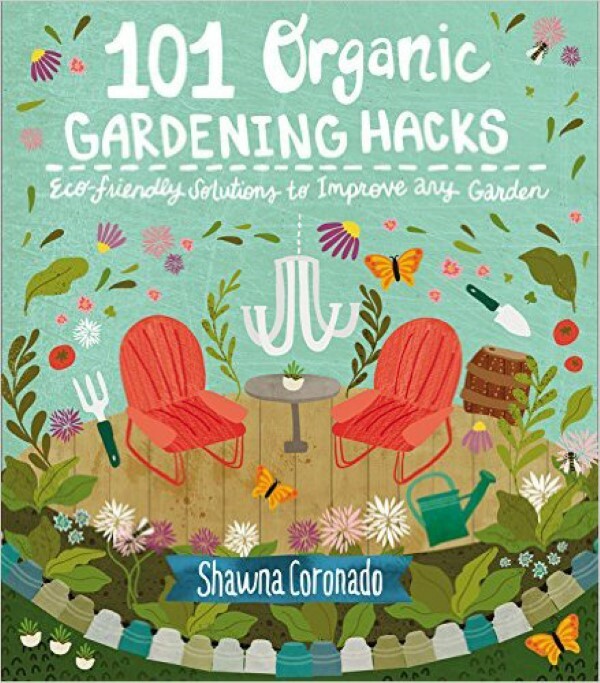 Shawna joins us today to share the details on how to create a no-till garden from her wonderful book 101 Organic Gardening Hacks. If you like this time-saving, soil-improving, organic gardening hack, you’ll love the other 100! If you love your soil, stop flipping it over. Instead of turning your soil over for a garden, start by removing all of the grass, either by stripping the sod or smothering the grass (see Hack 79: “Kill Grass by Smothering It”). 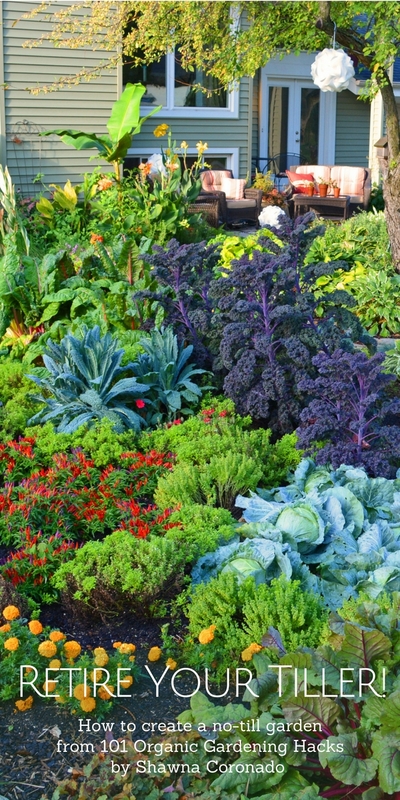 Put down a 2-inch layer of rotted manure or compost on top of the bare soil. Do not turn the soil over. Dig holes to plant your plants. Mulch the garden the first year with wood chips or another natural mulch, such as pine needles, rotted leaves, or straw. After the harvest at the end of the season, do not pull out the vegetable or herb plants by the root; cut their stems at the base of the soil and leave the roots in the ground to overwinter and eventually rot. Compost the cut plant matter. Next planting year, cover the garden with another 2-inch layer of compost. When planting new vegetables and herbs, only pull out roots from the previous year if they block an area for a new plant. Be sure to rotate the crop so that no plant from the previous season is planted in the same location in the current year. In your third planting year, follow the same practices, but add a layer of mulch instead of a layer of compost. In your fourth planting year, follow the same practices, but add a layer of soil instead of a layer of mulch. In the fifth planting year, follow the same practices, but add a layer of rotted manure instead of a layer of soil. In the sixth planting year, follow the same practices, but add a layer of compost instead of rotted manure. 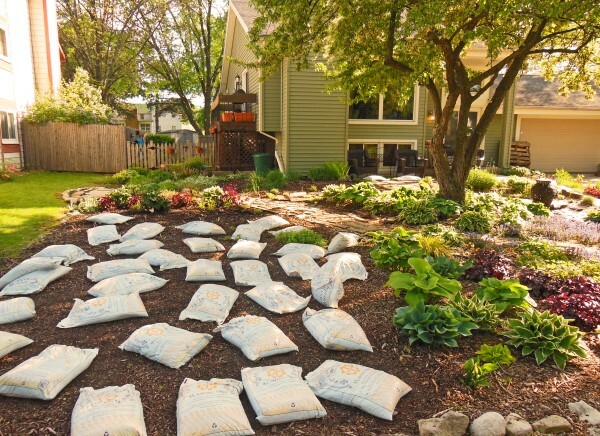 Continue every season layering up the compost, mulch, soil, and rotted manure without ever turning over the soil. Shawna Coronado is an author, columnist, blogger, photographer, and spokesperson for organic gardening, green lifestyle living, and culinary preparation who campaigns for social good. Shawna’s goal in authoring gardening and green lifestyle books is to promote a world initiative to encourage healthy and sustainable living. She was featured as a Chicago Tribune “Remarkable Woman” and speaks internationally on building community, simple urban garden living, and green lifestyle tips for the everyday person. 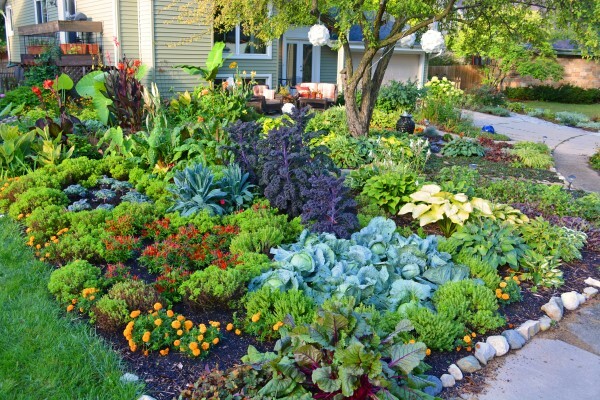 Shawna lives in the western suburbs of Chicago where she has a famous front lawn vegetable garden. You can learn more about her at www.shawnacoronado.com. Newspaper to snuff out grass and block weeds. We chop up our leaves in the fall and fill my beds with a good 4-6 inches of them. Keeps a lot of moisture in and prevents soil erosion. Then come spring I just pull away a small spot, plant a seed and leave it as mulch for the growing season. By fall, there’s room for more chopped leaves etc. enriches the soil. I also do vermicomposting and add that to my plants. When the county fair is finished in October, I get the leftover hay and poop from the animal pens. I let it sit over the winter, and mulch with it in the spring. It is amazing! I have a double composter, but I never have enough room. When I don’t want to add new material to my bins, I do trench composting. I dig a trench in an in improved garden spot and bury my kitchen waste. I cover it well. I’ve never had animals bother anything. My soil improves each year. Here is my predicament: My sister-in-law started a no-till garden on our ranch 3 years ago, which since she moved has now been passed on to my husband and I. However, with all her craziness of moving last year they didn’t garden much and now it is a giant weed and dandelion patch! Literally impossible to plant anything… we are thinking of stripping it and starting over. I know she put wood chips down before, and she is concerned if we disturb the soil too much it will have an effect on the productivity of the garden. I love this method and want to use it, I just feel we have to start over… any suggestions? How should we proceed to keep all those pesky weeds out?